It is finished! 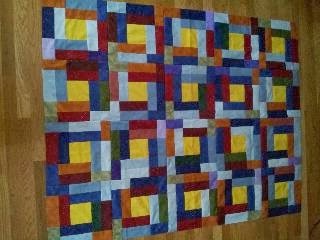 This is one of the quilts that I cut out this last weekend. It is only 48 x 60. This one is a youth size quilt. I don't plan on putting a border on it. In fact all I am going to do is turn it in "as is". If someone else decides that it needs a border, that is ok. They can put in on. I did the part I liked and I am happy with it. 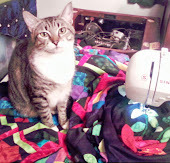 This quilt is such a quick quilt. The pattern is one that you can cut up your scraps and collect them until you have enough for a quilt. Here are the cutting sized to make a 12 inch block. Try it. They can get addicting. I am already planning my next one. I am a mother of 2 girls and I was a care giver for my mother Martha who passed away March 9, 2010. I am now starting a new chapter in my life and I am willing and excited to see where it takes me. My favorite saying is, "Don't sweat the small stuff!" when did we become a generation obsessed with parental guilt ?